Why use Propane Gas ? Here at Bigminni, we are incredibly proud of the excellent service we have been providing the Hollywood area since 1984. We expanded in 1991 to start providing a propane filling service for the area. For the past 23 years, we have been providing propane services to all manner of businesses such as roofers, welders, food trucks and restaurants; all the while keeping the local residents in good supply for their BBQ and camping needs. We are also more than a little bit proud of our facilities. We are located in one of the oldest buildings in the city of Hollywood, Fl. Our drive-thru is unique in the area as there are only a few left. We have a double-sided drive-thru convenience store where most stores are now walk-ins. 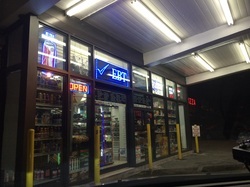 Bigminni has a well-stocked range of convenience store grocery items with the added bonus of a drive-thru. When hurricanes hit south Florida, we have been a consistent and reliable source of propane to our community. We have braved through Andrew, Katrina and Wilma to ensure that we were there to provide our services to the area. This year is our 30th anniversary of faithfully serving the community here and we feel privileged to be a part of this wonderful town. We are immensely proud to be a part of Hollywood, FL. and look forward to the next 30 years! © 2016, BigMinni Food Store, All Rights Reserved.